A federal grant that subsidized the salaries of firefighters will run out this coming January. City officials now have to find a way to replace that funding in the city’s budget. There is some unfinished business in the city’s new yearly budget. That chore will be for city officials to find funding for the Fire Department. And if a preliminary discussion is any indication, it could get ugly. A prelude to that challenge came up when Acting City Manager Kathy Angerer submitted a proposed budget to city council several weeks ago that does not fill four vacant firefighter positions. The firefighters’ union is expected to fight that and demand that at least two of the positions be filled. Fire Chief Danny Hagen told the council that without the two positions filled he cannot guarantee adequate fire service. That’s not the only contentious point. A federally-funded SAFER grant will run out in January of 2019, which is the halfway point in the city’s fiscal year. For the past two years the grant covered the salary costs of 14 firefighters, which totaled $2.3 million. The department’s total budget is $3.3 million for this year. At this point it is unclear if the city can continue receiving the grant. But even if it does, the grant program’s funding formula has changed, said Fire Chief Hagen. He said going forward the grant pays for only 75 percent of the salary cost. The city would have to come up with the remainder. Department-wise, firefighters and police officers are among the top earners in the city. Out of the firefighter staff of 2017, seven were paid in the $90,000 range a year. Another four were paid over $80,000, seven were in the $70,000 range, two were paid over $60,000, five earned over $50,000 and two were paid over $30,000, while one was new on staff and worked only part of the year brought in over $11,000. The highest-paid firefighter earns a little over $99,000 a year. That information came from a Freedom of Information Act request submitted by The Review. Hamtramck’s department also has a work schedule where firefighters work a little over two weeks out of the month. Their work days are around the clock with sleeping quarters on the second floor of the building. In this initial budget discussion, it also came to light that the department’s service runs are mostly in Detroit. A couple of years ago the department entered into a unique agreement with Detroit and Highland Park to answer calls to those cities, but the range for mutual service was supposed to be limited to one mile from outside Hamtramck’s city limits. However, Hamtramck has been responding to calls in Detroit past that one-mile limit – up to three miles. In exchange, Hamtramck is guaranteed crews from Highland Park and Detroit when there is a fire here. That arrangement came in handy over a year ago when a fierce house fire on Trowbridge – whipped up by a strong wind –threatened to spread to nearby houses. But in truth, there are relatively few serious fire service calls in Hamtramck. This arrangement has raised concern over the wear and tear of the city’s fire trucks and the possibility of firefighters being injured on the job outside of Hamtramck. The city’s employment contract with the firefighters’ union runs until 2020. Until a new contract is negotiated, the city is obligated to continue funding at its present level. But there are some options out there if city officials can’t find funding within its present budget. Chief Hagen is in favor of joining up with a public safety authority that includes the communities of Eastpointe and Hazel Park. Voters in those communities agreed to form the authority at a cost of an extra 14 tax mills per homeowner. The two communities share only the tax monies generated from the authority and do not exchange fire fighting services between each other. Hagen would like to have Hamtramck voters to decide on whether to join the authority. That arrangement would also require voters in Eastpointe and Hazel Park to agree on the deal. 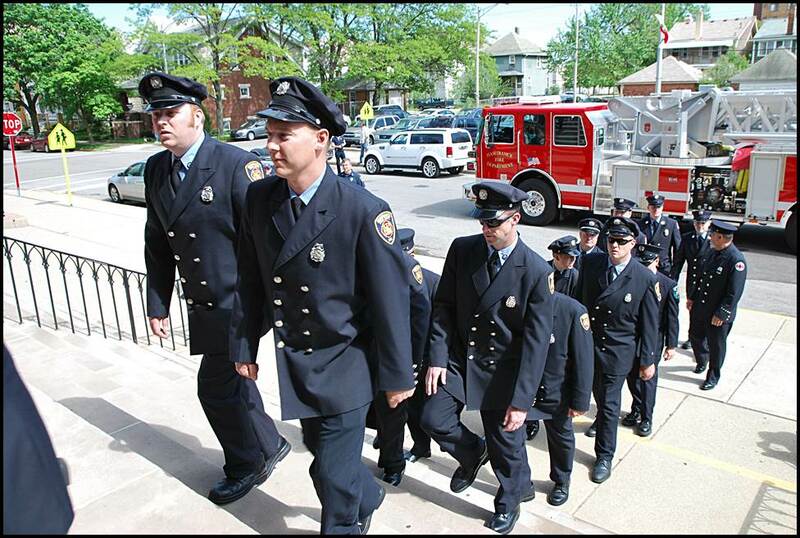 Hamtramck Fire Captain William Dickens also suggested another funding source surplus to cover department costs — tapping into the city’s projected $6 million budget surplus. “Try to figure out a solution with the fund balance,” he said in reference to the city’s budget surplus. City officials point out that the surplus was largely due to several one-time only financial windfalls – such as some temporary vacant department head positions and an unexpected increase from income tax collection.